Last days of March and here we are! I have many signs of spring now, and the birds are carrying on in the office gardens. Didn’t realize that a woodpecker could be so very busy. Besides for just the tapping, our friends have made a huge hole in the dead maple that still stands watch over the Koi pond. Patients young and old delight in the changing garden views each and every visit, as it is renewed. This is a reminder that every day, you too, are renewed. The systems of your body from your head to your toes is ever changing and adapting. Skin sloughs off as we bathe or it peels as we recover from too much sun. Digestion and elimination functions are never off duty. You are a marvel of amazing and adaptive cycles. Each adjustment provides a re-balance to your systems that stress may have altered, and resets you as it reconnects your brain-body cycle of LIFE. We have an oldie but a goodie saying, the Chiropractic is not about your back, or your pain, it’s about your Life. Absolutely! So, as clearly as Spring has sprung, keep aware of the renewing your body is doing every single moment. It is my privilege and passion to provide care and education as we journey together toward the best you can be! New patients appointments are daily, so if you have a friend or loved one that would like more information, they can call or click or tap to schedule an appointment. 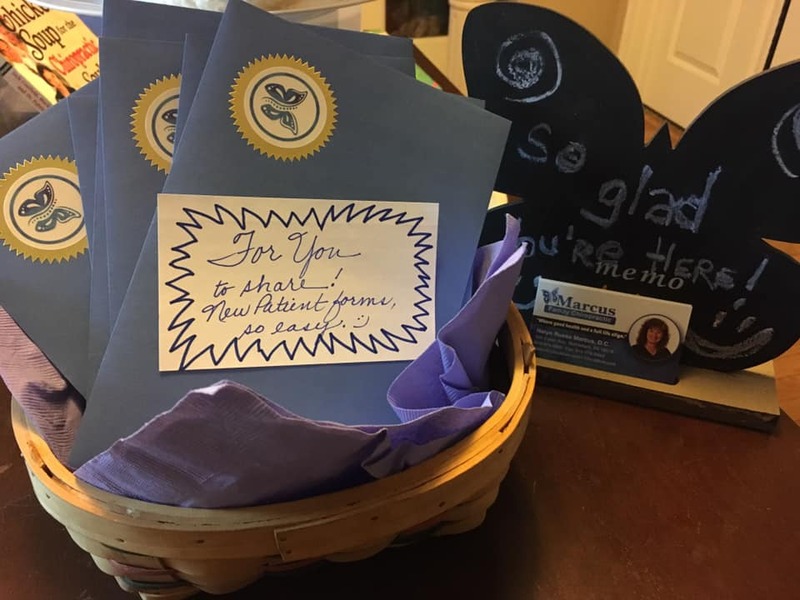 Also added to our community education effort is a lovely basket of blue envelopes for you to share. So easy to pass along this welcome letter and intake form and let your favorite folks know we are here for them. See you on the tables in front of our gardens! Older PostPLANT A SEED. PLANT HOPE FOR OTHERS!